The Far Tin Bandits is a completely new action game filled with fast, fun, far tin shooting action! 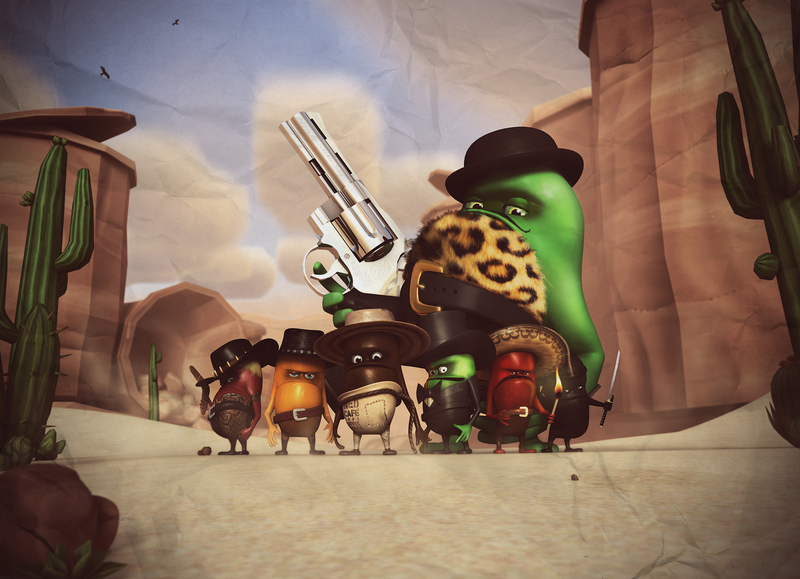 With a motley crew of seven uniquely skilled mutant beans, load up your barrels and shoot your way through a variety of fast and furious levels, leaving no tin unopened. The Far Tin Bandits shoot, split, spin, curve, explode, expand and smash their way through locations featuring runaway mine carts, winding whirl pools, tenacious totem poles, ghoulish graveyards and much more. It's fast, furious, far tin, fun. The first game from Fight Brothers studio and creator Darren Williams, the Far Tin Bandits is a fast paced shooting game for mobile devices and tablets. The aim is to clear the scene of tins as quickly as possible using the least amount of bullets. There are 6 stages based on different themes which each have 12 different levels to complete. The play mechanics allow the user to adjust the direction, path, angle and spin of each projectile, depending on the particular bullet character being fired. If the player obtains bronze, silver or gold star ratings in each level by completing them in record time, upgraded guns are unlocked, allowing the player to fire faster, reload quicker and complete levels faster than ever. The game has a humorous style aimed at both kids and adults alike. Not complicated and rather stress relieving, The Far Tin Bandits is as add-free game that can be picked up and played whenever you need a quick blast fix. Available on both iOS and Android platforms. Developed in Unity.